SunYuan ISO D-P-O-Q series products are Sunyuan's newly developed industry leading small capacity (SIP12 Pin) low cost PWM pulse width modulation signal isolation transmitter IC. The duty cycle of the single chip microcomputer, PLC/DCS, and instrumentation output PWM square wave signal can be isolated and converted into a standard 4-20mA/0-10V analog signal to realize the isolation amplification and display control function of the single chip PWM signal. SunYuan ISO DPOQ integrates multi channel high isolation DC/DC power supply, analog amplification and conversion circuit, PWM signal isolation control circuit, etc. in the same module, especially suitable for DA reduction isolation transmission of industrial field PWM signal, single chip microcomputer, field bus, Ethernet IoT, PLC/DCS host computer for multi-channel sensor signal acquisition and analysis. The internal integrated high-efficiency DC-DC isolated power supply supplies power to the internal output conditioning circuit, DA conversion circuit and output signal isolation circuit. SMD process structure and new technology isolation measures enable the device to achieve 3000 VDC isolation of auxiliary power supply and PWM signal input and analog signal output. And can meet the industrial requirements of wide temperature, humidity, vibration and the harsh working environment. 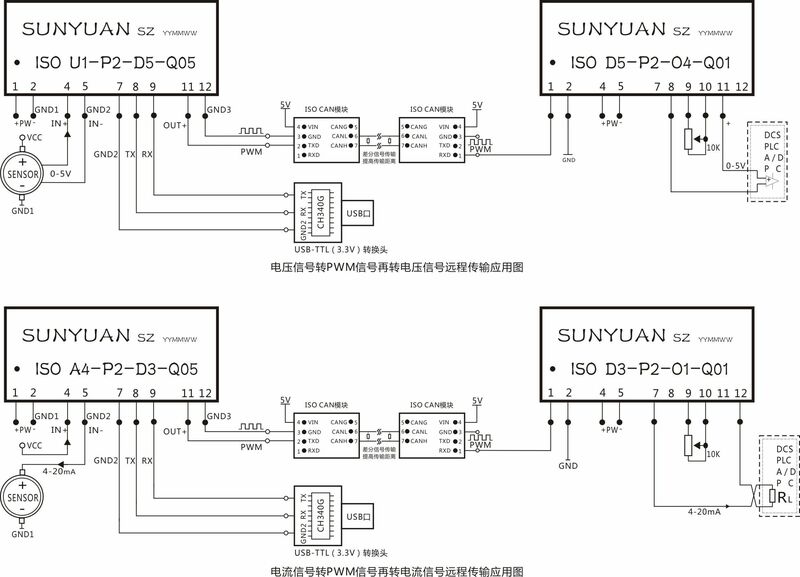 The SunYuan ISO D-P-O-Q series is very easy to use and can realize the isolation and transmission of PWM signals and analog signals without any external components. The ultra small 12 pin single row (33.0X15.5X10.5mm) and standard PCB board mounting design simplifies user system design options, reducing size and wiring costs. The product has an IC package mounted on the PCB, DIN35 standard rail mounting and PIM panel display embedded installation. DIN rail type installation can realize signal one-in-one-out, one-in-two-out isolation transmission function. The PIM panel embedded intelligent transmission table can realize various functions such as sensor analog signal isolation display, alarm control and long-distance distortion-free transmission. Widely used in metallurgical mining, petrochemical, power equipment, medical equipment, industrial automation, new energy facilities and military research, users can choose the right products according to the needs of the site. Example 1: Signal input: 20KHz square wave; Signal output: 4-20mA; response time of 100mSec; Auxiliary power supply: 24V. Example 2: Signal input: 50Hz square wave; Signal output: 0-5V; 3Sec response time; Auxiliary power supply: 12V. Application 1: The 4-20 mA/0-10V analog signal output from the sensor and transmitter is isolated and converted into a PWM signal by the ISO U-P-D-Q module. Remote distortion-free transmission through the ISO CAN module, and then reduced to 4-20mA/0-5V analog signal by the ISO D-P-O-Q module for linear precision control. DIN35 rail mounting product application: The 4-20mA/0-10V analog signal output from the sensor and transmitter is isolated and converted into PWM signal by DIN1X1 ISO U-P-D-Q module. Remote distortion-free transmission via ISO CAN module, and linear precision control by DIN1X1 ISO D-P-O-Q module to 4-20mA/0-5V analog signal.